Maidenhead is a town in the Royal Borough of Windsor and Maidenhead, which is in the county of Berkshire. It lies on the south (or west) bank of the River Thames - there are a few different theories floating around as to exactly how the name Maidenhead came to be. There was, in 1280, a wharf was built on the bank of the River Thames and this lead to the area being called Maiden-hythe (meaning: New Wharf). Other theories point towards the Welsh Celtic name of Ma-y-Din-Heth (meaning: place of the Fort of Barley) being the source of the name. There is also the theory that it comes from the 'Maiden's Head' - this was said to be the skull of one of St. Ursula's eleven thousand virginal handmaidens that were massacred in Cologne, although it is widely believed that this is just a legend rather than historic fact. 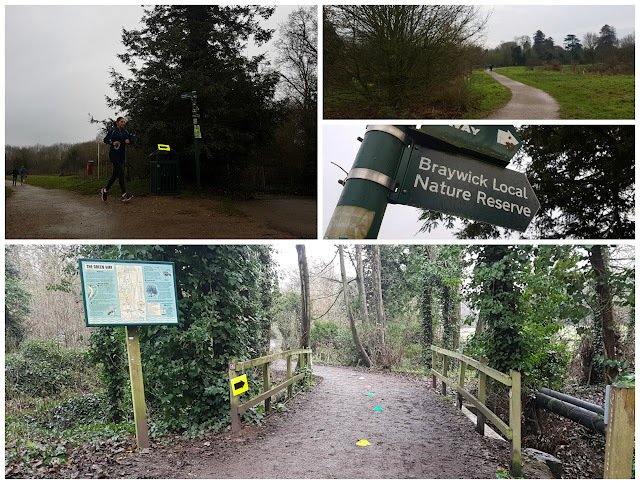 Maidenhead parkrun is based at Braywick Park which is just to the south of the town centre and is the largest open public space in Maidenhead. Braywick itself is noted as one of the earliest settlements in the Thames Valley area with evidence of mesolithic flintwork dating from at least 5,000bc and neolithic pottery dating back to 3340bc. In the park itself, there is also evidence that a Roman road once ran through it. It has also been the location of 18th and 19th century mansion houses. In more recent times, mineral extraction took place here - once that ceased, the area was used for landfill before finally becoming a public park. Braywick Park covers an area of 40 hectares and is largely used for sports. In fact, you'll be hard-pushed to find a sport that isn't covered here - there's an athletics track, football and hockey pitches, a gym, archery, and golf driving range. Maidenhead Target Shooting Club and Maidenhead Rugby Club are based here. You'll also find SportsAble, which is a sports association for disabled people, a play area and an outdoor 2012 Olympics outdoor physical activity area. Adjacent to the sports fields is a 15 hectare nature reserve, which provides a range of habitats for wildlife. It also has an education centre, where the park rangers run a wide range of educational events. The eastern border of the park is flanked by a 23km long river called The Cut which rises in North Ascot and flows into the Thames. Parking at the venue is quite straight forward as there is a fair-sized public car park next to the main vehicle entrance to the park just off Braywick Road. At time of writing, the car park is free-of-charge at the weekends. It is worth noting that there are a few different car parking areas in the vicinity, so you must make sure you park in the correct one. There is also an open space next to the parkrun meeting area which people were parking in, but it was unclear (to me) if this is part of the official car parking area or not (it's not mentioned on the Maidenhead parkrun page). The closest train station is Maidenhead and this is located just to the north of the park. For cyclists, there are bicycle racks adjacent to the main car park. There are also some toilets in the park and they are located in a building over near Maidenhead Rugby Club and the artificial football pitches. The parkrun meeting point can be found by following the road to the left of Stafferton Lodge (Toby Carvery) right to the end. Stafferton Lodge is a mid-Victorian villa and is built on the site of the Staverton family's second home, which was called 'Little Stroud'. Their main home was called Stroud Manor and was located in Holyport (2 miles south of Maidenhead). William Staverton was one of the surveyors of Maidenhead Bridge. At the meeting point you'll find the aforementioned 'open space' and a small hut/shelter thingy. This is where the participants and volunteers congregate pre-run. About 10 minutes before the start of the run, a very entertaining and informative 'new runners' briefing was held where the course was described in detail. 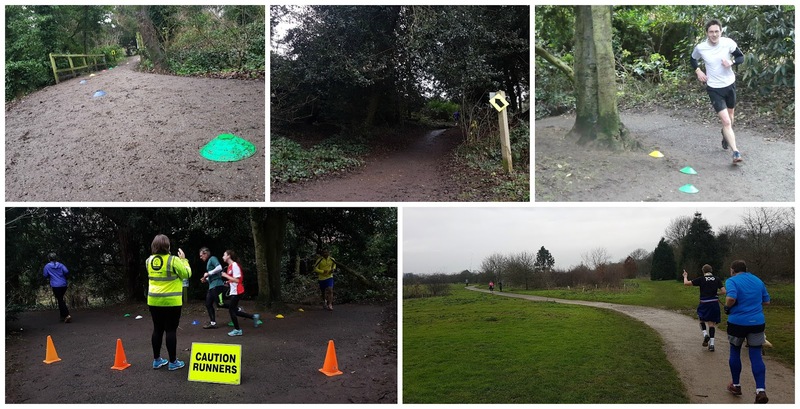 For the record, buggy runners will be fine on this course but will need to be extra mindful of ankle-clipping at the pinch points / tight turns, especially near the beginning of the run. The main briefing took place and it was time to head off. The run starts in the 'sports fields' part of the park which is nice and wide, but after about 100-or-so metres all the runners must filter onto a much narrower path. This winds its way towards the nature reserve, which is where the majority of the run takes place. A sharp left-hand turn awaits the runners shortly after and the runners then reach the main loop which is run twice. The rectangular-shaped loop of the nature reserve is run in a clockwise direction and is mostly firm underfoot, but in the winter it's likely to be splashy and a little muddy so I'd say trail shoes are better during the colder/wetter months. The far side of the loop is run adjacent to The Cut and at the end of this section there is a short two-way path across a bridge where you keep to the left. This is followed by a fiddly, twisty section which features a short, sharp uphill climb (great fun!). Apart from that, the entire course is flat and sheltered from the wind, so it is quite possible to run a fairly good time here if you're in the mood. After two laps around the perimeter of the nature reserve, the runners break off from the loop and head back along the windy opening stretch until they reach the sports fields and the finish line where they can collect their finishing token. If you think you have run a personal best, pick up the PB bell and give it a ring! I didn't have to opportunity to do so because I had run at a fairly comfortable pace and stopped to take some photos on the way around. I had my barcode scanned right next to the finish line before heading back into the nature reserve to have a little cool down, takes some photos, and to thank the brilliant volunteers out on the course. As mentioned above, I visited on New Year's Day 2017 a few of the marshals were wishing every single runner a happy new year, plus they were so smiley and bouncy - they really made my visit here very memorable. 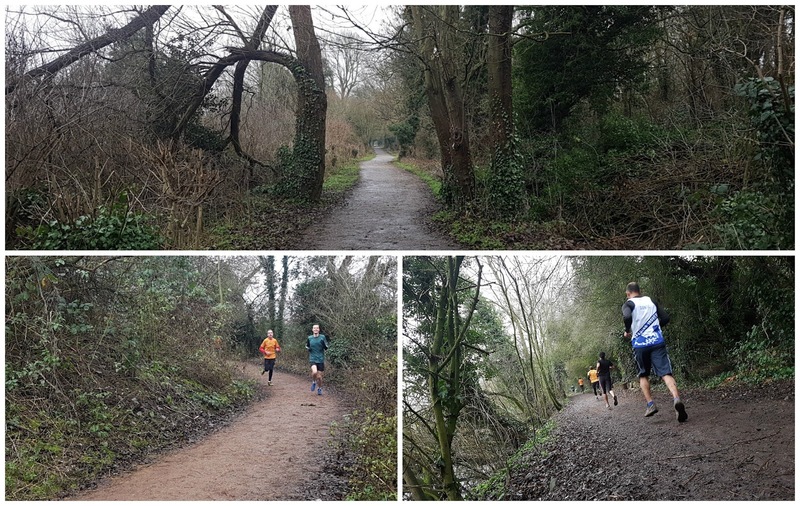 I had recorded the run using the Strava app on my phone and if you want to see the elevation data etc, you can view it all here: Maidenhead parkrun event 93. Being New Year's Day, there was no time to hang out with the team post-run as I had to dash over to Woodley, but on a regular day, I understand that they go to Stafferton Lodge (Toby Carvery) for a coffee and a chat. I hear the all-you-can-eat breakfast includes a 'breakfast yorkshire pudding', but be careful if you are vegetarian because they actually contain bacon. 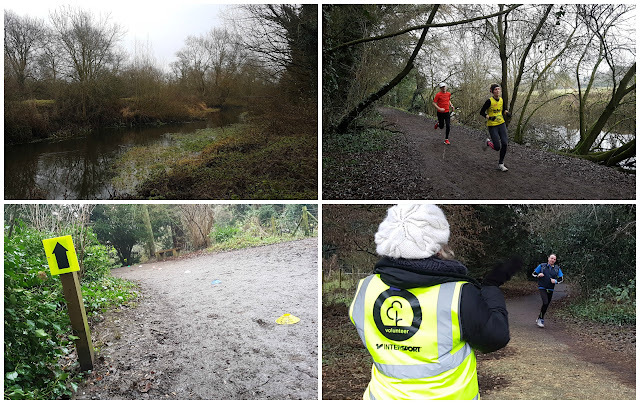 I'd had a very enjoyable visit to Maidenhead parkrun, but it was now time to move onto Woodley parkrun for round two of my New Year's Day double. The official results were processed shortly afterwards and I saw that there had been 188 runners on-the-day of my visit, which is pretty much about the same as a regular Saturday morning parkrun here.